Turn up your open back dress styling with this new release from Moondance Boutique called “Cinnie”. The Cinnie necklace comes with multiple attachments for many different layers of elegance that drape down your back. 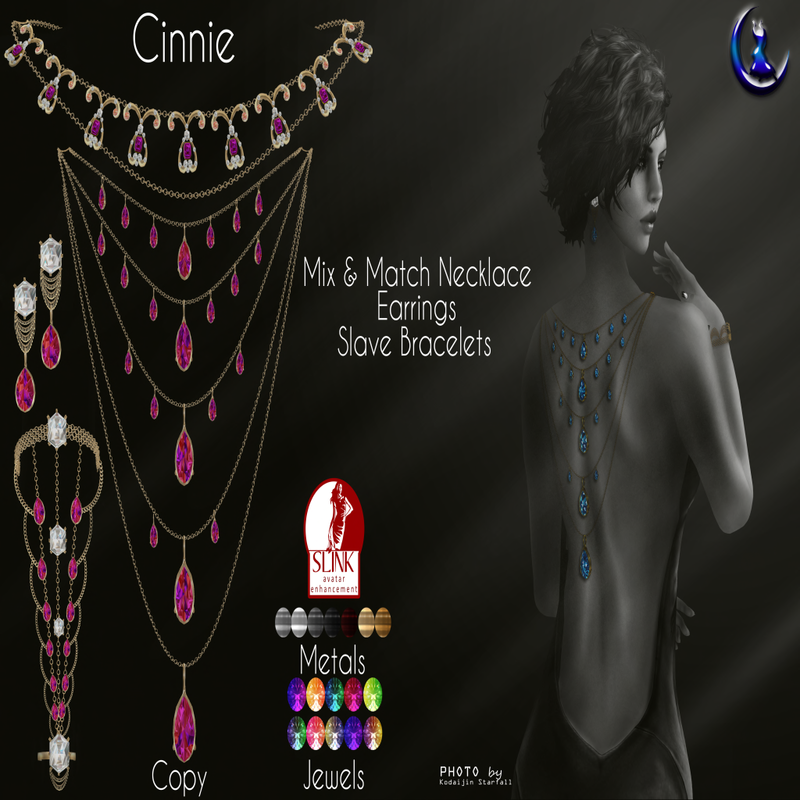 Cinnie also comes with earrings and bracelets with chains that attach to a ring which are made for Slink Elegant hands. Each piece is HUD activated for a multitude of different color combinations. Poses are by Vestige – “Project Runway – Striking set” poses are set to be released soon. The Project Runway poses are straight from real life runway shows, such as, Versace and Victoria Secrets. They say every man must fall. The November theme at The Instruments is Happy is Chic with prints galore. 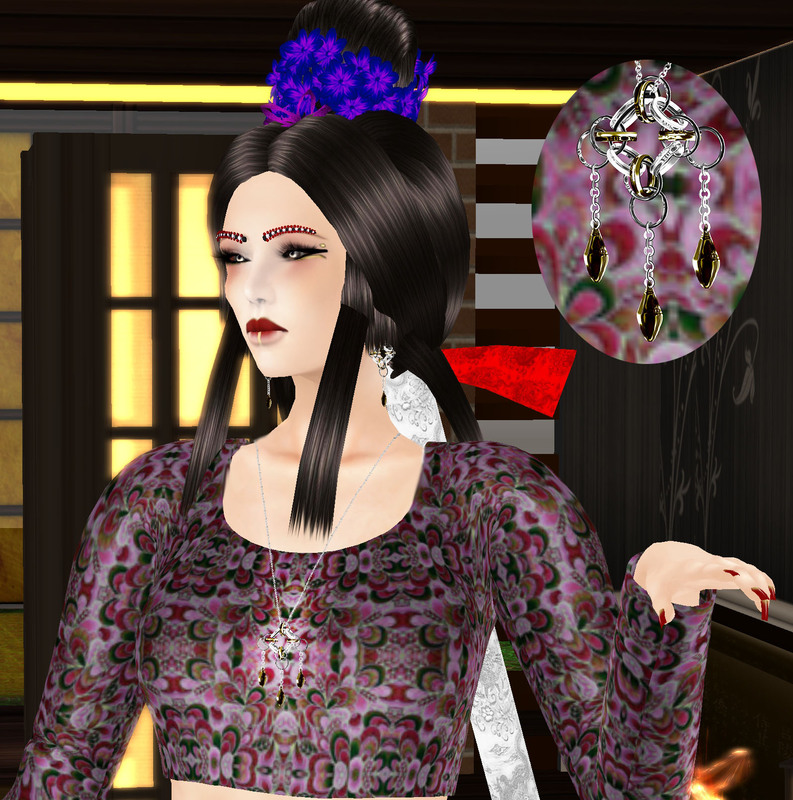 We have for the occasion the Momo top and Skirt which both offer 10 fabrics ~ 8 prints and 2 solid exotic skins. Both pieces are available separately. Nine more days before Milan Fashion Week starts. We’re counting down to a week full of events and excitement. Brought to you by Solo Evane Agency, and featuring some of the most creative designers on the grid. Starting on April 10 to 14, 2013. One of the designs I would like to showcase today is, “Evolve”, created by Reign Gongrejo. I’m featuring her beautiful “Marrant” gown, tailored to show off those long legs with a long flowing train and ruffled top. It is a show stopper all in its own and runway worthy. “Evolve” Show – April 11 at 1 P.M. SLT. To see the full schedule of events, please visit this Solo Evane page – Milan Fashion Week 2013 Hope to see you there!